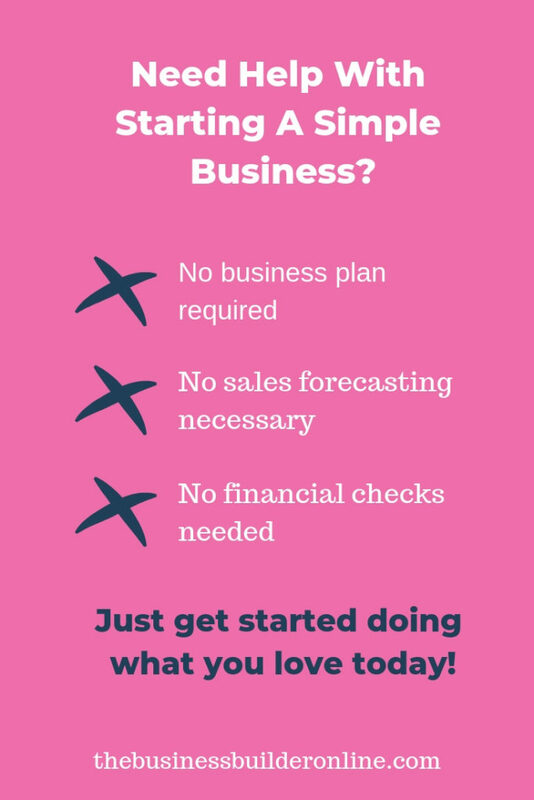 Would you like help with starting a simple business but are put off by everyone talking about business plans, sales forecasts and financial structures? If you just want to start selling cakes, skin care, dog blankets or stuff that you’ve found in your attic, you probably don’t want to go to all that hassle. You just want to find out how to promote yourself online so that your business can grow as fast as possible with as little fuss as possible right? The good news is that you don’t need to do lots of planning and preparation if you have a simple business idea. In some ways, it’s almost better to start trading and then figure the rest out later once you know for certain that you have a market for your product or service. They start promoting their business online to see what interest it generates. If there is enough interest then it’s worth doing all those things to ensure that the business grows. But you don’t need to do them all yet. You don’t register until you have been making money consistently for 3 months. This way you will know whether or not your business idea is viable and sustainable. It doesn’t matter how much money you make, it could be £30 per week or £5,000 per month, the point is that you are making it “consistently” that means that you are making £30 per week on a regular basis. Once you start making a consistent income, you then have 3 months to register your business with HMRC. So, how can you test whether you have a good business idea and give yourself a fair chance of attracting those much needed customers? Simple, you promote your business online. Yes, you are able to promote your business online even if you haven’t registered it yet. Remember, you have 3 months before you need to register. Make those 3 months count by doing as much as you can to attract as many leads and customers as you can in that time. If you start making money in month 1 great, but the most important thing is to test how popular your idea might be by attracting leads. Leads are people who have shown an interest in what you have to say and sell. The more leads you generate, the more customers you will inevitably get in the future. Now before you get all excited and think that you can go out and make a load of money before you have to declare it etc, I have to tell you that building a business is hard. It takes a lot of time and effort. It is really hard work and you need to be consistent with your action steps. Most new businesses fail within their first 5 years, in fact up to 80% of them fail. That’s a lot isn’t it? But do you know why they fail? Okay, sometimes we realise that our business model doesn’t work, or it needs a tweak here and there, and sometimes we need to change our whole business structure to make it more customer friendly – but that’s business, we are in constant flux, we will never stop making changes to our business to make sure it works for us. But the fact is, unless you know about business models, business structuring, promotion and marketing and sales, how will you know whether it’s working or not? To succeed in business you have to become good at a lot of things that you might not like, or want to do. You have to become a business person! But, before you decide to give up on the whole idea I’m here to tell you that it can be really simple to get your business up and running and attracting customers, even if all you have right now is a vague idea of what you want to do. Over the last 5 years I have helped hundreds of new and small business owners to get their businesses noticed online and making money faster. How do I do this? I run free workshops so that local business owners can come and learn about online marketing and pick up a few hints and tips. You can find out more about them and book a place here. I run a 5-day course in online marketing to help you to implement the 4 main strategies into your business and get them working for you in just one week. You can learn more about that here. I have a quick start programme which is online and helps you set up all the technical things that will get your business noticed and, more importantly, gathering leads for you day in, day out in just 4 months. You can find out more about that here. I have a 12-month mentoring programme where I will work with you on a one-to-one basis for 12 months to help you develop not only your business, but your mind-set too so that you are capable of dealing with the pressures and overwhelm that will inevitably overtake you sometime within your first year. You can find out more about that service here. As you can see, EVERYTHING I do is designed with just one thing in mind, getting your business to become profitable and making money for you sooner. Help with starting a simple business. So, if you need help with starting a simple business, step this way. I can help you to develop your proposition so that you stand out in the marketplace. I can help you get your social media set up so that it attracts leads for your business. I can build a website for you if you don’t have one. I can create a landing page, sales page, lead capture page so that you can collect emails. I will also help you to develop a follow-up series of emails to send to your leads so that you can start to build a relationship with them and let them know what you can do for them. I can also help you with goal setting and making sure that you plan your next steps properly and stay on track to achieve these goals. I can also help you out in practical ways too, such as introducing you to loads of free tools and apps that can automate huge parts of your business so that you need to do even less to keep it going. Sound good? Call me on 07736 396519 for a no obligation chat about how I can help with starting a simple business in the easiest and least expensive way possible. I really hope to get to talk to you or meet you soon at one of my workshops or courses. Until then. I wish you well and send my best wishes. Next PostNext Is Starting A Business Easy?